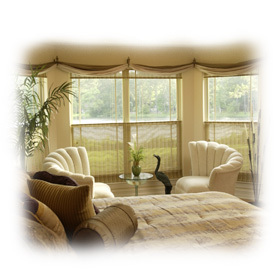 The next generation of window fashions, Trio Convertible Shades are a soft-fabric window covering that gives you three beautiful choices: clear views, complete privacy and anything in between. All with the use of a single cord, the cellular-vane design allows each vane to open and close for variable light control, privacy and excellent insulating properties. The popular brand that originated the honeycomb shade category, Hunter Douglas' Duette honeycomb shades come in sheer, semi-sheer, semi-opaque and opaque fabrics to give you a choice in light control. 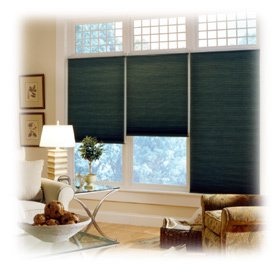 Distinguished by a crisp, clean style, the honeycomb construction of these soft, yet durable Duette shades—available in single, double and triple honeycombs—make them highly energy efficient. 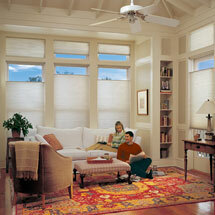 The latest innovation from Hunter Douglas is Architella honeycomb shades. Offering greater energy efficiency, greater sound absorption and a radiant color palette, Architella is the next generation of honeycomb shades to enhance your home. 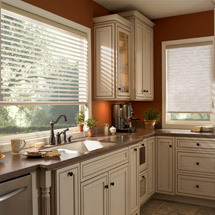 Applause honeycomb shades come in two opacity options and colors ranging from subtle earth hues to dramatic jewel tones. Constructed from our patented energy efficient honeycomb design, which traps air to insulate your interior from the heat and cold, these shades are available in single or double honeycomb designs. 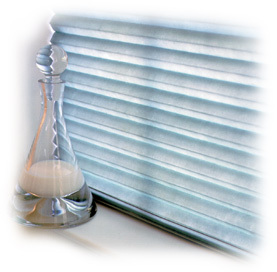 ﻿﻿Today's Honeycomb Shades offers three distinctive specialty fabrics - sheer, semi-sheer and triple honeycomb. 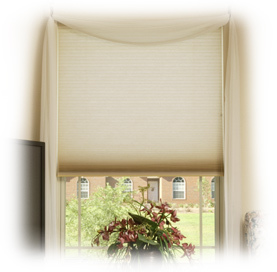 The sheer Honeycomb Shades fabric is perfect for letting in the light.